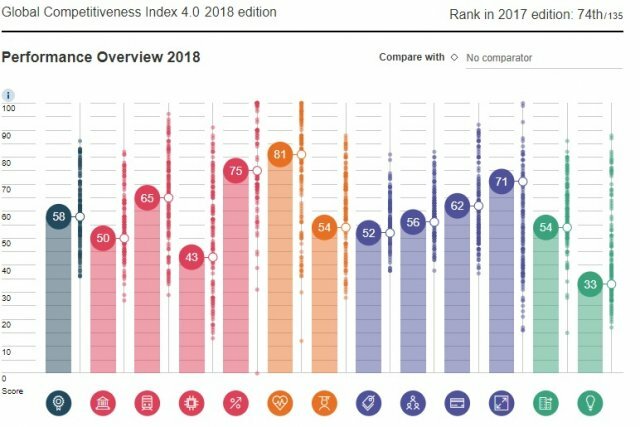 Country 77th out of 140 economies in Global Competitiveness Index 4.0 2018 edition. Vietnam dropped three ranks in the Global Competitiveness Index 4.0 2018 edition to 77th out of 140 economies, according to the World Economic Forum’s Global Competitiveness Report released on October 17. Through 98 indicators organized into 12 pillars, Vietnam jumped to a score of 58.1 in 2018 from an overall 57.9 in 2017. The new tool maps the competitiveness landscape of 140 economies. For each indicator, using a scale from 0 to 100, it indicates how close an economy is to the ideal state or “frontier” of competitiveness. Vietnam has made great achievements in Health, Market Size, Infrastructure, Skills, Labor Market, and ICT Adoption. Meanwhile, indicators such as Business Dynamism, Product Market, Institutions, Infrastructure, Financial System, and Innovation Capacity dropped. Only Macroeconomic Stability remained unchanged. When combining these factors, the US achieved the best overall performance, with a score of 85.6, ahead of Singapore and Germany. The average score for the world is 60; 40 points away from the frontier. Singapore ranked second in the overall rankings (83.5), with openness as the defining feature of the global trading hub and one of the main drivers of its economic success. The country also leads in Infrastructure, with a nearly perfect score of 95.7, thanks to its world-class transport infrastructure and connectivity. Besides Singapore and Japan, Hong Kong SAR (seventh, with 82.3) is the third economy from East Asia and the Pacific region in the top ten, confirming the widely-held view that overall growth momentum in the region is set to last. These three economies boast world-class physical and digital infrastructure and connectivity, macroeconomic stability, strong human capital, and well-developed financial systems. Australia (14th, with 78.9) and South Korea (15th, with 78.8) are among the top 20. The biggest gap in the region lies in the development of an innovation ecosystem. New Zealand ranked 20th on the Innovation Capability pillar, while South Korea ranked eighth. Emerging markets such as Mongolia (99th, with 52.7), Cambodia (110th, with 50.2) and Laos (112th, with 49.3) are only half way to the frontier, making them vulnerable to a sudden shock, such as faster-than-expected rises in interest rates in advanced economies and escalating trade tensions. The changing nature of economic competitiveness in a world that is becoming increasingly transformed by new digital technologies is creating a new set of challenges for governments and businesses, which collectively run the risk of having a negative impact on future growth and productivity. This is the key finding of the report. According to the report, which in 2018 used a brand-new methodology to fully capture the dynamics of the global economy in Industry 4.0, many of the factors that will have the greatest impact in driving competitiveness in the future have never been the focus of major policy decisions in the past. These include idea generation, entrepreneurial culture, openness, and agility. One unifying theme among the world’s most competitive economies is that they all possess considerable room for improvement. For example, while the report finds that Singapore is the most “future-ready” economy, it trails Sweden when it comes to having a digitally-skilled workforce. Switzerland, meanwhile, has the most effective labor reskilling and retraining policies and US companies are the fastest when it comes to embracing change. One of the report’s most concerning findings is the relative weakness across the board when it comes to mastering the innovation process, from idea generation to product commercialization. Here, 103 countries score lower than 50 in this area of the index, which is topped by Germany, followed by the US and Switzerland. The report notably finds that attitude towards entrepreneurial risk is most positive in Israel and tends to be negative in several East Asian economies. Canada has the most diverse workforce and Denmark’s corporate culture is the least hierarchical; both critical factors for driving innovation.